Today we bring you the interview that we have made to Alexander Hendler, Producer of Asterix & Friends. In the interview we asked him about the game's main features, the reasons of their decisions, and which are their main strengths to succeed in a market so crowded like the strategic management of MMOs. Check it out! First of all, thank you for giving us the possibility to interview you about Asterix & Friends. Would you be so kind to introduce yourself to our readers? Hi! My name is Alexander Hendler and I am the producer of Asterix & Friends. Together with our team, we have been working on this game for several years now. I’ve been working in the games industry for about 7 years now, and shipped several console and free to play titles. Asterix & Friends plays an important role for many of us, since we all grew up reading the comics books and watching the movies, and this project gives us the chance to deliver a game for all the Asterix fans out there. How would you describe Asterix & Friends to someone who has never heard of it before? 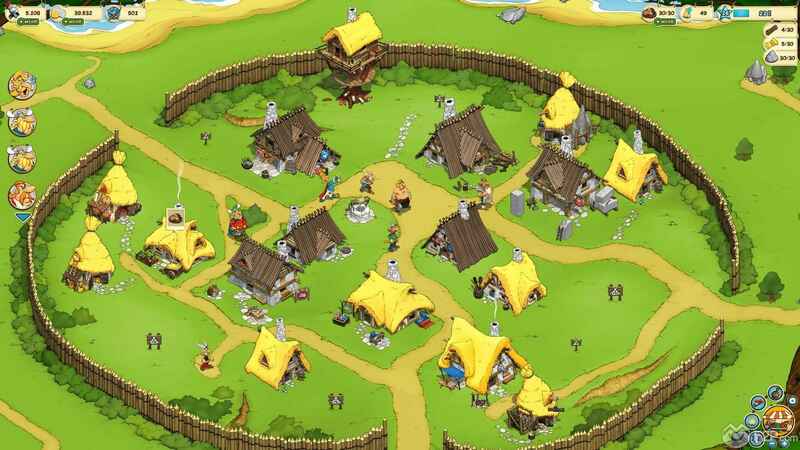 Asterix & Friends is a free-to-play builder game, based on the wonderful and very popular Asterix comic books by René Goscinny and Albert Uderzo. It allows players to build up their own village of indomitable Gauls, and features tons of quests, achievements, Player vs. Player fights (“village brawls”), the ongoing battle against the Romans and much more. Why should a player choose to play Asterix & Friends over any other game? How does it stand out? If you’re already a fan of the Asterix books or movies and of builder games in general, this game is an obvious choice. 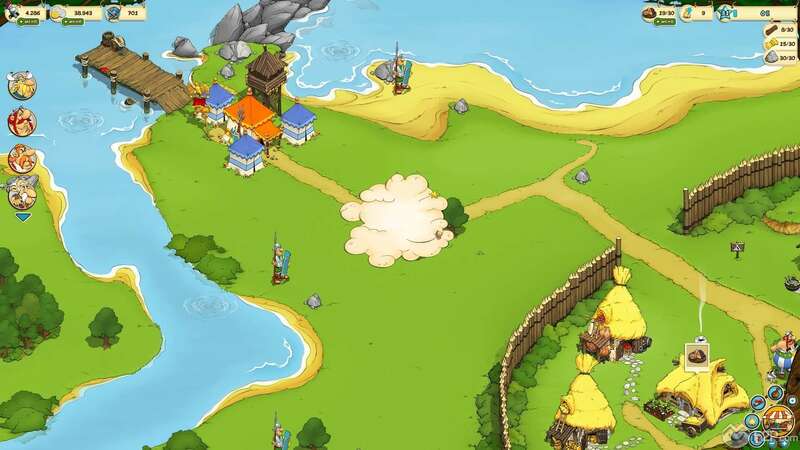 If you’re new to the world of our indomitable Gauls, you will find a very enjoyable, beautifully designed game world. It has a strong backstory, lots of humor and almost no violence (ok, you need to fight Romans and brawl with other villages, but in a very comical and non-bloody way). Out of curiosity, why did you decide to make a game about Asterix & Obelix? Tell us something about the game’s lore and background story. We got approached by a Publisher who had the license to develop a game based on the universe of Asterix. It was a great opportunity for us to be part of such a strong brand, and to develop a game which reflects the atmosphere and mood you get out of the comics and movies. 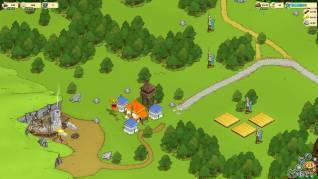 With builder games, you usually start from scratch: you have nothing and build up your own village/city/etc. Progress is very important in that genre. So we agreed upon the fact that your village (which is not the village of Asterix) got destroyed by the Romans and you have to rebuild it. The whole story, art, design and style was designed in a very close cooperation with the official licensor, LEAR (Les Édition Albert René), based in Paris. Asterix and Obelix visit and support you regularly, and assist you in fights or offer quests. You have to build up your village, upgrade your buildings, craft items, strengthen your villagers, fight romans, reconquer the village surroundings and travel to famous places like Egypt to build a palace for Cleopatra – more to come. Can you tell us something about the game's social features? What kind of player interaction can we expect to see? There is a strong cooperative element in Asterix & Friends. Players can chat, trade items via a safe trade feature, join guilds and help each other fight Roman legions. There is also a Player vs. Player feature with single player and guild rankings for players with a competitive spirit. It’s a lot of fun! 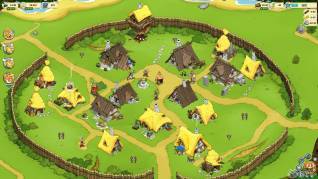 In what ways can we customize our Gaulish village? At first, you will have to rebuild your village from scratch, constructing and improving commercial and residential buildings. 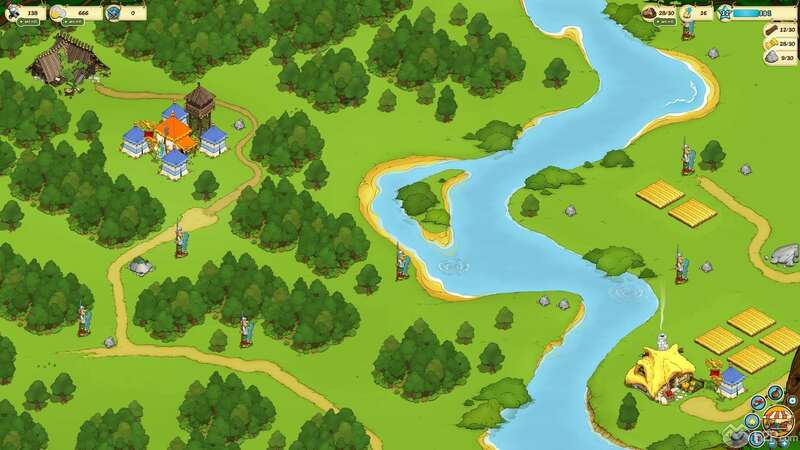 You can swap these buildings around to create your favourite village layout. Production buildings also feature visible decorations with several stages of expansion. Let's talk about PvE. In addition to the armies of Rome, we have to fight against other enemies of our favorite Gauls’? You mainly fight Roman patrols (on your village map) and Roman legions (on the friendsmap), but there are also crocodiles in the Egypt adventure as well as boars that you hunt for food and other items. What can you tell us about missions? Will we have to visit iconic locations like Rome or Egypt? We will help Asterix and Obelix in their adventures or will they help us in ours? Both. 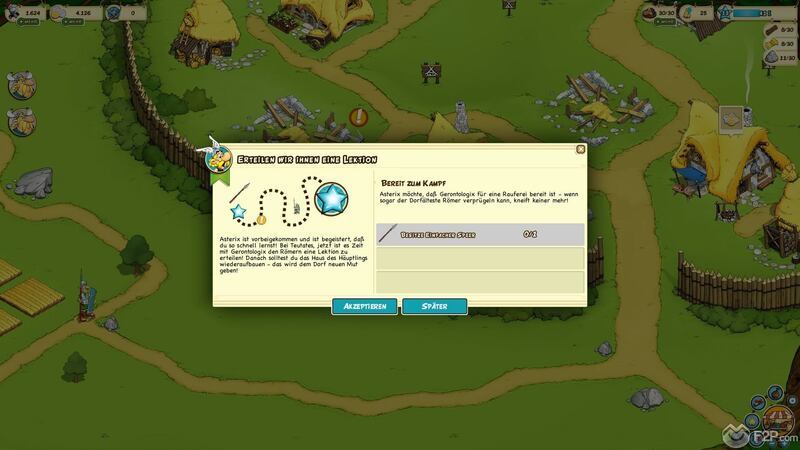 Asterix & Friends features a lot of quests and quest chains. Some of them unlock Asterix as a temporary additional (and invincible) fighter, some quests involve Asterix and Obelix as quest-givers. Apart from that, at Level 20 you can start the adventure in Egypt, helping Edifis to build Cleopatra’s Palace. Can you tell us something about the combat system? How does it work? There are basically two types of PvE fights against Roman oppressors. On your village map, you can fight Roman patrols and camps of varying strength. Roman camps are guarding important landmarks like a bridge and resource buildings. When you fight Roman patrols or camps, your village will attract Caesar’s attention, as shown by the resistance meter (or “Caesar-mood-o-meter”, as we like to call it). 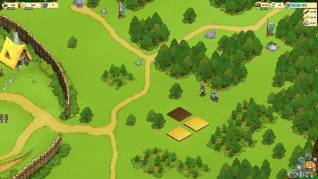 A higher resistance level will lead to more powerful Roman legions marching to your village. You can fight these legions on the friendsmap, and you usually need more than one fight to defeat them (other players/villages can help you with that). If you fail to defeat a legion in time, your village will be overrun, resulting in the respawn of all patrols and Roman camps on your village map. In what ways can we customize our troops? Your villagers can gain up to three equipment slots, starting out with one slot. You can equip your villagers with weapons that add strength, as well as helmets and shields that reduce incoming damage or shorten your fighter’s recovery time. It’s time to talk about PvP. What can you tell us about the Village Brawl system? The village brawl system is completely independent of the PvE system. You do not have to take part in PvP to progress in the game, but you can gain a lot from brawling with other villages. Every brawler can be equipped with one PvP item and one potion (providing bonuses like additional strength, defense, critical chance, etc.). Some PvP items can be bought, some can be crafted. Your villagers will be available as brawlers, but you can also add Edifis, Epidemais and the egyptian workers to your team. You first select three brawlers and a resource as a wager. Your brawlers are matched against the opposing village’s brawlers. If one is defeated, the next in line will take his place, until all brawlers of one village are defeated. If you win the battle, you double your wager, but if you lose, the opponent will receive it. There’s also a certain chance for a random item drop in PvP fights. At the end of the season, your village will get a reward based on the league you finished in. Apart from that, there’s also a guild ranking. Fighting in the village brawl also gains points for your guild. Just like in the single player tournament, at the end of the season, guild members will receive rewards based on the standing of their guild. What sort of late game activities can players hope to get into, in both PVE and PVP? PvP is a strong loop and it gives you the chance to be #1 in our rankings. PvE is very challenging as well, since the Romans’ strength is adapted to your villagers’. This enforces teamwork in the late game. Furthermore, we have a guild system, where players of a guild have to gather guild-experience by fighting PvP or PvE. Your guild-experience then determines the guild level, and the higher the level of a guild, the better the bonuses you receive. These bonuses are really useful, so being in a guild is very beneficial. Does the game feature a Cash shop? If so, what type of items can I find in the cash shop? The game features an in-game market, where you can buy items like weapons, collectibles, starter-bundles, etc. with our premium currency “Roman Helmets”, which can be purchased for cash. What can you tell us about future plans for the game? We are constantly working on big and small improvements to the game. Coming up is our September event with a focus on crafting and PvE. Adding new adventures like America or Great Britain is also being considered. We are also working on a mobile version, which will hopefully see the light of day early next year. Thank you for all your answers. Would you like to add something? Thanks for reading! I hope you enjoy the game as much as we do!